1. Preheat the oven to 200ºC, gas mark 6. Bring a medium pan of water to the boil and add the potatoes. Cook for 6 minutes, then drain well. 2. Pour the olive oil into a large roasting tin and place in the oven for a few minutes to heat up. Add the drained potatoes and mushrooms to the oil and mix to coat, spreading out to a single layer. 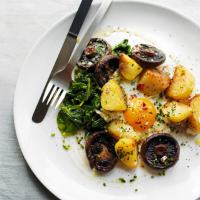 Return to the oven and roast for 15–20 minutes until the potatoes are golden and the mushrooms are softened. 3. Scatter over the shallots and chives, toss in well, then crack the eggs over the top of the potatoes and mushrooms. Sprinkle with the chilli flakes, if using, a grinding of black pepper, and return to the oven for a further 8–10 minutes until the white of the eggs is set and the yolks are cooked to your liking. Serve immediately. Delicious with wilted spinach.